Do You Have Tooth Enamel Issues Related to Celiac Disease? Well, I have 9 Ways to Strengthen Your Tooth Enamel NATURALLY! I am sharing this post today because we have spent the last two years focusing on this in our house, thanks to the damage that Celiac Disease has caused to my son’s teeth. My husband also has tooth enamel issues (since he, too, has Celiac Disease that went undiagnosed for much of his life) …but he does not like me talking about his pearly…uh, whites. So just forget now that I even mentioned him here. Only a couple of years ago, my son’s teeth were not in the best shape due to the tooth enamel defects that we have since learned can be caused by Celiac Disease. When you are suffering from issues such as Celiac Disease, food intolerances, and conditions that tend to affect your nutrient absorption, you are at risk for de-mineralization of your tooth enamel. When the digestive system is impaired, it does not properly release vital minerals into the body for use by the teeth in building enamel. So, unfortunately, my oldest son suffered from quite a few dental carries and other dental issues, despite being gluten-free and having impeccable tooth care skills. I decided I was going to go on a mission to do something about it. So after endless research, visits with holistic dentists, and copious note-taking…I wanted to share with you some of the important steps that you can take to try and re-mineralize your teeth (or your child’s) and strengthen the enamel. And I also wanted to let you know that these steps have worked for us. 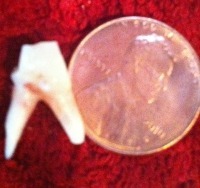 My son’s (and husband’s…shh) teeth are in wonderful shape and health now. This is just a basic breakdown – there is so much more and the science behind it is actually very fascinating, but I will just leave you with the basics of what can help in this process, since I am sure that is what you are looking for anyway. Did you know that your tooth enamel is 96% mineral content and is the strongest substance in the human body? Unfortunately, this enamel can easily be leeched out through poor diet, lack of nutrient absorption due to digestive damage, or from acidic environments in the mouth. Acidic foods and drinks are the worst for tooth enamel. They slowly dissolve some of the minerals out of your enamel every day. Processed Foods: Cookies, Muffins, Refined Sugars, High Fructose Corn Syrup – due to the starch that is difficult to break down and then causes more acid to be present in the mouth. Commercial Toothpastes – for many reasons, but sodium lauryl sulfate, glycerin, and flouride are just a few. But, here is the good news. 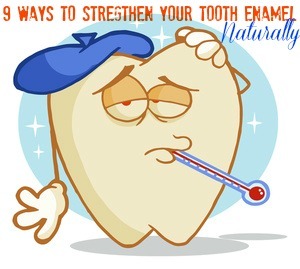 There are ways to actually strengthen the enamel and re-mineralize it. With a little dedication and some information tucked under your belt, you can begin the process NOW! Ensure that you have adequate levels of Vitamin D in your diet – D provides the proper balance of calcium and phosphorus to support mineralization. Pure fermented cod liver oil, krill oil, salmon, other fatty fish, and egg yolks are good sources. For Vegan sources – sunshine, UV-irradiated mushrooms, yeast, fortified foods, and D3 supplements are all options. Ensure that you have adequate levels of Vitamin K2 in your diet – K2 is essential for bone growth and mineral absorption. High Vitamin Butter (raw pastured is ideal) High Vitamin Butter Oil, Marrow, Egg Yolks, Chicken Liver Pate, and Hard Cheeses are good non-Vegan Sources. For Vegan sources- Supplements or Natto (requires an acquired palate) are options. Ensure that you have adequate levels of Vitamin C in your diet – C ensures strong gum health. Good sources are papaya, bell peppers, strawberries, broccoli, pineapple, brussels sprouts, kiwi, kale, and oranges. Homemade Bone Broth – true bone broths are full of calcium, gelatin, and minerals that are easily absorbed by the body for bone growth and are wonderful for re-mineralization and encourage enamel growth. Traditional Sea Salt – not processed table salt. True sea salt contains many trace minerals that are vital to bone and enamel growth. Add more Strawberries into your diet – not only because they are high in Vitamin C and antioxidants, but also because they have a natural exfoliating effect due to the malic acid content. The malic acid helps to whiten teeth while removing harmful tartar. So…if you have suffered from dental/enamel problems because of absorption or diet-related issues, you may want to try some of the above steps. It is not an overnight process. It takes time and diligence and consistency since your tooth enamel is in a constant state of flux between demineralizing and remineralizing. But the best part of the above steps is that every one of them also benefit your health in so many other ways as well! Now..tell me. Have you suffered any dental issues that you think may be related to your food intolerances or Celiac Disease? how interesting! i had no idea there was a link! thanks for sharing! Thanks for the information. It will help so much. I am a 37 year young women who recently found out I have celiac. I have had tooth problems since childhood. It encouraged me to hear that your husband’s teeth have improved. Happy gluten free eating to you! this information is so helpful. I’ve recently noticed my teeth not as they normally would and i didn’t connect it to limiting certain foods that i’ve learned I can not tolerate or just for the pure fact that some foods just mess up my body for a few days. It is interesting to learn all of the things that you have shown through the research and i’m going to definately use it. Thank you so much and best wishes to you and your family. Hi Eidin! It is amazing how much of a connection there is to what we put into our bodies and then how our bodies react to them. I hope you are on a wonderful path to health! Do the 9 ways to strengthen tooth enamel apply to aligning teeth in order (teeth have grown in crooked)? What an absolute wealth of information this post is! (sorry about the garbled grammar!). It’s great that you also offer ways to RE-mineralize. . . so helpful for everyone, not just people with celiac. 🙂 Thanks for this post, Kim! Wow! I am finding out how so many issues are linked together in some way. I do not have Celiac Disease, but do have Food Allergies to Wheat/Barley/Rye as well as some others Allergies and Intolerance’s. I never connected all of these issues with Digestive Health and now Dental Health together with the Allergies. Now as I connect the dots I am blown away. Thanks for sharing this. I am on a researching journey and finding out lots of helpful information that will in turn help me and my family in tremendous ways. Thanks for sharing this. Curious, are dental issues extremely common among those with Celiac disease (almost a sign of it), or just among some? Any thoughts? Alisa, dental issues are far more common with Celiac Disease and other digestive-related issues than you think. Our dentist is seeing more and more issues now and says he is surprised at how many people are dealing with enamel issues due to their digestive problems. Just one of the many things I love about you is how you get determined and then do something! Great post. I love this post! Thank you for sharing. Tony (my husband) has always suffered with enamel issues due to celiac. I will definitely share this with him in hopes to help in the future! This is making me wonder if my son has Celiac disease. 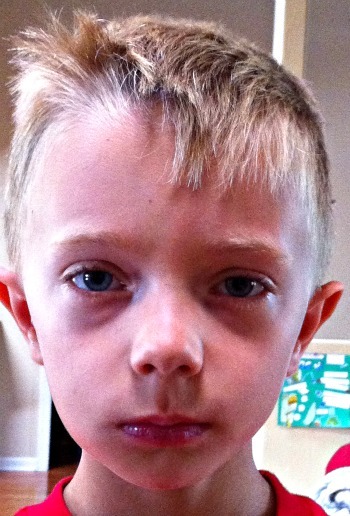 He has food allergies. He also had a molar pulled that got a “hole” in it. Which to me seems like a cavity but the dentist said it wasn’t. He has had many fillings done and has those odd spots on his teeth. We thought it was from fluoride. Wish I had known about the crap before buying that horrible nursery water! Anyways, he is only 6 and has all these teeth issues already. Anytime he eats grains he does get a little red flare up on his cheek that goes away after about 1/2hr. My cousin has celiac disease. Is it hereditary? I believe she has nut allergies like him as well. Is there a test? I am wondering how you healed your gut? It sounds like Ellen used the GAPS Diet. We’re on it, too. Wow! Ellen, how amazing that you are doing so much good for yourself and your body! I am so glad that you are doing so much better already! Congratulations on your diligence and hard work! And I really believe that the fermented cod liver oil plays a big part in the healing. Oh and I have just not been able to give up that coffee either…but I am good on the rest of the list. As for the coffee, can we just ignore one? 80-20 rule, right? ps your boys are so lucky to have you! Maggie, I have made that toothpaste many times before. The hard thing is that, in the winter, the coconut oil hardens so it takes a bit to soften in your mouth. I am going to go check out that site you mentioned. I wonder if they ship to the US? Just wondering, if a dentist tells me I have a neurological problem instead of a mineralization issue (without knowledge of my gluten inolerence/celiac), should I show him this research & reinforce I am GI and this could be possibility? Hope that made sense,dealing with results of motorcycle accident while relearning not to poison the body, feeding me properly, and rebuilding my body’s immune system is challenge….. as I redo retypos *giggle slow hands..good editing..;}. After looking at list of foods,I am thankful I have been eating most of them my whole life..had never heard of vitamin K2. Thank you for this article. It connects another set of dots in the mystery of accident recovery’s affect on my body and its effects on. Putting you on favorites list. We journey better, assisting one another along the way! Back on the hunt for gluten free supplements,fish oil,mmmmm. I had the enamel issues since chilhood but it wasn’t diagnosed until age 47. On the advice of one of my professors at TCM college years ago (1980’s) I started using an ayurvedic toothpaste AURAMERE and drinking green tea. Both help remineralize with naturally occuring minerals, whitens and desensitzes. I haven’t had troubles except when I’ve visited a dentist that made many claims about being wholistic but was nothing but a huckster out to make money. I’ve honestly had much better oral hygiene STAYING AWAY FROM DENTISTS and being very diligent with daily care. The same for my DBF of 12 years. I make my own gargle from sea salt saline and various herbs. I use hydrogen peroxide diluted 1/2 strength with water frequently as well. Has anyone come across a good recipe without the coconut oil? I’ve been experimenting but I don’t care for the oily-ness! Hi Barb! I know some people who like to use this combination: Combine 1 Tbsp baking soda, 1/2 Tbsp salt, 1/2 tsp ground cloves or Sea Salt (if you do not mind the saltiness). Then Wet enough to form a paste on your brush. It is more of a tooth powder that becomes a paste when it gets wet. The coconut oil is to make it a little smoother over your teeth and it also has some good anti-bacterial and health properties. But I agree that the oily-ness takes some getting used to. Oh my goodness YES! That’ s me to a ‘t’. I just didn’t find out about it till I was over 40 🙂 Lots of damage done. I use flouride free toothpaste and have homemade broth but I’m so forgetful about drinking it. I had my body tested and found out that I was both extremely low in Vit C and D. Go figure. I’ve never been tested for Celiac but have definite gluten/dairy issues so we avoid those as best we can. This is such an informative and well written post! Wow-I will be making my husband who has Celiac Disease read this tomorrow morning. I recently started oil pulling and look forward to trying some of your other fabulous suggestions. Man, I am so living this right now! Two years ago, I started to make the connection so my gut problems and gluten, and I’ve been trying (sometimes more successfully than others) to get it out of my diet ever since. About a year ago, I made my annual trip to the dentist, and I almost fell out of my chair when he told me that he was going to need to fill 8 cavities. 8!!! I thought he was joking. After all the fillings, and drilling, and TMJ flareups, and HUGE dental bills, I hoped I would never see the inside of a dental office again. It was insane, I had gone my entire childhood and adult life having only 2 cavities, and now BAM! Here’s 8 more. I assumed it was related to the fact that I had my 2 sons, I thought it was some kind of mineral loss from that. I still struggle with enamel issues, and a couple of my caps have broken off, but I am hesitant to go back to the dentist, I can’t bear to hear more bad news. I use Tom’s of Maine toothpaste, and I started using ACT enamel building swish, and I bought some sesame oil with the intention of starting oil pulling (I have a hard time getting up earlier to do it before the kids wake up!). It’s funny, I’ve always been overweight, not underweight. I never thought I had issues with mineral absorption and I sometimes wondered if I was making up this whole gluten intolerance thing. But the bloating, tiredness, depression, gut ickiness, and flushed feeling I get after eating desserts or breads have to mean something! I need to be more diligent in keeping gluten out of my diet! Wow! My dad’s side of the family and 2 of my sisters join me in having dental problems. Both of them have recently gotten dentures (in their 50’s) and I’ve been fatalistic thinking I will too. I’m wheat allergic and sensitive to gluten. I’m going to see if I can stop the damage with your recommended list. Hi Sherri! I hope that some of these steps can help you rebuild your enamel and then hopefully prevent you from going down the same dentures path as the rest of your family! 😉 Thank you for sharing your story! This is all so fascinating. I am in the middle of blogging about this issue, based on everything I’ve read this morning PLUS my own experiences. I have ALWAYS gotten cavities and dentists have complained that I brush too hard, thus my enamel erosion. Based on my regimented oral hygiene and diet, I shouldn’t have cavities or disappearing enamel….but then I read this post about all of the possible reasons I could be suffering from lack of oral health. I have learned SO much from this post AND from reading others’ comments, and I am still on a roll researching all this, which just intuitively makes sense to me now. It NEVER made sense when dentists told me that I was brushing too hard and drinking too much soda. I don’t drink soda! They otherwise could not account for my poor teeth health. How fabulous to stumble across your site! I am new in blog land and just set up my new blog site. Currently doing a 2 week sugar free challenge with my readers. I will share this resourceful blog as I have many that have allergy to food questions. Kale. Baking soda toothpaste. Drink a little baking soda. Drink a little apple cider vinegar, organic. Eat no beef. Eat some chicken and or white fish stewed in with kale, squash, broccoli, zucinni, and in a month your teeth will have remineralized. Guaranteed. Forget dentists. And eat no sugar, honey. Have stevia instead. Great tips, Bri! All of those go a loooong way in helping to remineralize the teeth! 🙂 Thanks for sharing. I have to add to my comments… When I say eat some chicken or some fish, salmon is ok too, I suggest that we eat less and less of it. Stay on a vegan diet as much as possible. I have a cavity on my eye tooth and it’s quite visible. My dentist wants to drill it off and put a cap on it. It aim to keep the tooth by keeping it clean, no sugars. My vegan diet and I are going to march right back into that dentist’s office in 6 months and amaze her. She’s going to see that my tooth is staying where it is, and will get better. Oil pulling helps generally, and my teeth are getting substantially more white as the enamel gets stronger. Don’t get fooled by dentists and their mantra as to how your teeth can only be fixed by their hard fisted, coupled with the American diet, approach. Think about it. Are the natives in Borneo or in other 3rd world countries dealing with bad teeth? Bad skin? Hair going white? No they are not. Why? Because their diets are so natural, no processed food or sugars. I’m 60 and i feel like I’m 20 now. It took less than a year to renew myself but I did it. Good luck to you all. Have you discovered a toothpaste and mouth wash that has been working for your family? My son has lots of tooth decay. Do you think the oil pulling is something we should try with him or can we do a few of the other steps? I am not sure how well he will do the oil pulling. Any suggestion where to start? If we supplement with VIt D, C, and K what is a recommended dose for a healthy 10 year old? I am so glad someone else has shared this info! We have dealt w/enamel issues/decay & it is a nightmare. People judge you even though your child who never even had a drop of juice, formula, etc. had issues w/their teeth…. from the moment they broke through the gums. Years later, once we learned of a gluten issue I told every dentist we saw & was told by all of them they had never heard of such a thing (the connection to gluten issues/celiac to dental issues). I don’t see how there could NOT be a connection… I mean if your body can’t digest what you eat, how is it getting nourishment?! I get really fired up about it all because of what we went through with it… & I see kids all over the place now w/silver crowns… & I am hearing from so many parents whose children had to go under general anesthesia because they were so young to have repair done, had too many teeth to get repaired in office w/out having to drive back & forth 15 times, the child was too young to cooperate, etc. SOMETHING is up & it isn’t lack of fluoride! I don’t think every child w/decay/enamel issues has gluten issues, but I think there are so many whose parents have no idea… & are blaming themselves, even though their child eats well, gets limited sweets, no juice, brushes & flosses teeth at least 2x a day, etc. Great post! I have celiacs and demineralization on my front teeth, have come across Dr. Ellie and Kiss your Dentist goodbye http://www.drellie.com/ on how to keep your teeth clean, that we have not been taught that. She uses Xylitol to dissolve the bacteria in your mouth. Have also started using a tongue cleaner and oil pulling. To learn that the white spots will heal given that I don’t mouth breath (allergy induced I am sure) and give my body the minerals to use! Also there are ways to stop mouth breathing and all the health issues that that effects as well. There is hope. Just one little step in my healing process as well. I have just turned 18 & have been a coeliac for all of my life, becoming critically ill when about 2 for them not knowing what was wrong with me. Teenage years have by far been the hardest for me with the lack of resources available and the temptation to consume gluten! However, after becoming ill again- but not knowing exactly what is wrong with me I am pleased to see the resources have become a lot stronger than what they were! I’ve suffered from every other side effect coeliac causes, IBS, anxiety etc. and you don’t realise how much is actually related and how serious related health issues can be. Recently my problems have mostly been related to my teeth, they have become alot more sensitive even to cold weather (I’m guessing due to enamel deficiency) and hAve infact had teeth not grow back (one baby tooth that came out and never grew back) to then find out I have another baby tooth left which has no tooth above. People definitely underestimate the psychological problems related, this has caused so much stress knowing I’m going to have to fund about £1000+ to replace/fix broken teeth! This is very informative — thanks! My middle daughter is almost 6 and has had horrible problems with her tooth enamel. We took her to the dentist for the first time when she turned 3 and she already had 10 cavities and needed 2 root canals on her molars and 2 crowns. Her teeth are sensitive and hurt to chew on even when the dentist says that she has no new cavities. I have 2 other children who eat a very similar diet and have the same dental hygiene habits, but their teeth are perfect. We have questioned whether she could have celiac disease or some type of food intolerance. She gets stomach aches and has a lot of gas, and often has a big tummy (from bloating, presumably). Over the last 6 months she has developed a really strong body odour and has to wear deodorant (she is only 5 years old!) I make a natural deodorant using baking soda, arrowroot, and coconut oil so I feel ok about using it on her, but she just seems too young to have to need it. She also gets bouts of hives that we’ve never been able to find the cause of (even after seeing a pediatric allergist and our family doctor many times). We recently saw a naturopath and she suggested doing a trial of removing gluten and dairy (she eats very little dairy to start with though). We haven’t started yet because I don’t know whether to get her tested for celiac disease through our family doctor first. I’m not sure whether a formal diagnosis will matter — if she does improve off of gluten, then we’ll know that we need to avoid it from here on. thanks for info. very helpful. Hi Kim, do you have a video clip showing the proper ways of oil filling? And, is palm oil ok for it? And, can someone add oil filling to their services like the Dental implants in Long Island? Will sea salt break down enamel if i brush my teeth with it? these tips are very useful for us.thanks for sharing it. I’ve got a very bad gum receding problem, no dentist can help me or seems to know what causes it. Do you have a dietary plan or advice which can reverse the receding process and regrow the gums. Many thanks. Thanks for sharing your information from all the research you have done ! Just want to share one thing that has helped me immensely, which effects how well the body absorbs nutrients- choosing “Proper Food Combinations” at meal time. Because different food groups requires different enzymes to properly digest, eating wrong food type combinations often times antagonize each other and cause digestive and nutrient uptake problems. Fruits and Vegetables should never be eaten at the same meal, nor should Fruits and Proteins be combined. To achieve optimal nutrient uptake, ween yourself from drinking liquids with meals, as liquids dilutes the digestive juices the body prepares into the stomach for digestion, which makes the body work harder to digest the food, and also effects the quality of nutrients the body can absorb. If you are like me and have suffered from the effects of silver amalgam/mercury dental fillings, I have weaker digestion and have to supplement with digestion aids which make a big difference. And of course the more “uncooked/unheated” fruits and vegges we eat, the more natural digestive enzymes we have. The source of information that has really helped to improve my overall health came from an inspired writer, E.G. White and the book “Diet and Health”. Hope this helps you as well. smile. Hi there, I have a question about oil pulling. So I started oil pulling for a few weeks (almost a month) and my teeth became more sensitive than before, and also a small part of the tooth chipped on the bottom front tooth. Its small enough that it does not need a repair, but it has made the sensitivity much worse. I have read online that some people’s teeth become more sensitive when oil pulling because sometimes oil pulling can actually pull out minerals as well. Have you heard of anything like this happening? Hello! I never knew that Celiac Disease was related to tooth enamel! I am 15 years old, and I have had Celiac Disease since i was 6. My enamel is soft, and I have tried TONS of different things to make it harder, the last thing I would’ve expected was a mineral deficiency! My teeth are genetically yellow, and I would like to have them whiter by a certain date. I am very happy you shared this; I finally have an answer to my problem! This gave me closure, and I will be sure to follow these methods. I can’t thank you enough! THANK YOU!!! I had been taking Apple cider vinegar capsules for the treatment of high Uris acid problems. I was relieved of the uric acid problem but in the process my tooth enamel got damaged. I am happy to learn that tooth enamel can be retrieved naturally by having proper intake of foods.